The meeting of the East Area committee to decide the planing application for Mickey Flynn’s Pool and Snooker Hall will take place at Cherry Tree Day Centre, St Matthew’s St, Cambridge CB1 2LT on the 11 September at 7.00 pm. The meeting is free to attend and if you have any interest in the future and the sustainability of our small independent traders on Mill Road your support will be most welcome. Please see below a letter to from the Mill Road Society to the traders of Mill Road. This was written in response to Dawecroft/Micky Flynn’s visiting the traders who signed our petition, (objecting to the application for change of use), and asking them to take their names of it. As a member of Mill Road Traders Association and a Trader on Mill Road who has campaigned and worked hard to promote the unique and special nature of Mill Road, I feel I should keep you updated, as there currently seems to be a lot of misinformation around the Mickey Flynn application. 1. 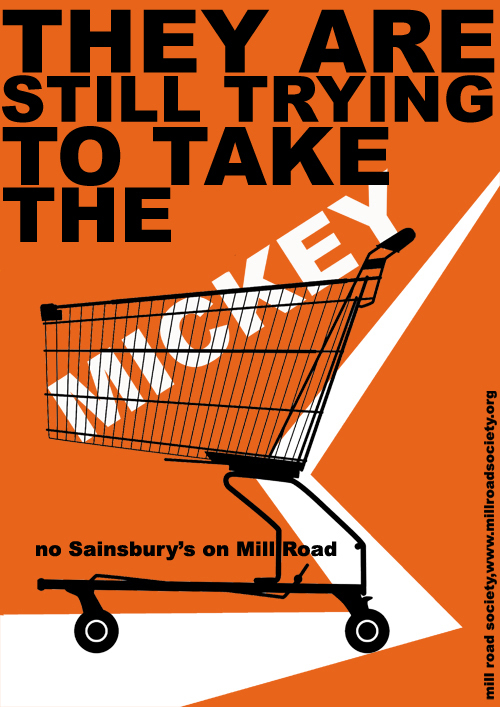 Should planning be approved for A1 use the proprietors of Mickey Flynn expect to ask Januarys to offer the lease to prospective tenants and then choose – not the highest bidder – but someone they consider will be good for Mill Road. 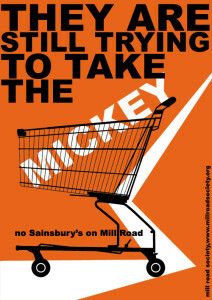 But in 2011, they argued that a Sainsbury’s convenience store would be good for Mill Road. In the current application, Januarys specifically states that Policy 6/8 allows additional convenience shops within existing centres provided the floorspace does not exceed 1,400 sqm net, so the building would comply. 2. According to the planning system, explained to us by Tony Collins, the planning officer overseeing these planning applications, should the Applicant fail to get A1 permission, but get planning permission for Classes A2 (professional services), A3 (restaurants or cafés) and A4 (drinking establishments), they can subsequently change this to A1 use without having to get planning permission. 3. Dawecroft have put their own interests at the heart of all their applications. By contrast Mill Road Society, including residents and traders, have put the interests of our community first, and the survival of our local independent and family-run A1 food retail shops. A convenience chainstore supermarket has nothing to add to Mill Road. Like other stores of this type, checkouts will most likely be automated and will not provide jobs. Many of the things that the community is trying to achieve: a unique character focused around its shops, arts, fairs and culturally diverse groups, will be undermined. We urge you to stand by your petition signature. Another thing to consider with this planning application is that we are led to believe that the rented value of the property is between £75,000 – £80,000 per year. It is hard to see who would be able to afford that amount of annual rent (+ business rates) other than a large multination corporation. Which in common language means a chain store/supermarket/ or any other inappropriate retail store on Mill Road. You are currently browsing the The Mill Road Society blog archives for August, 2014.